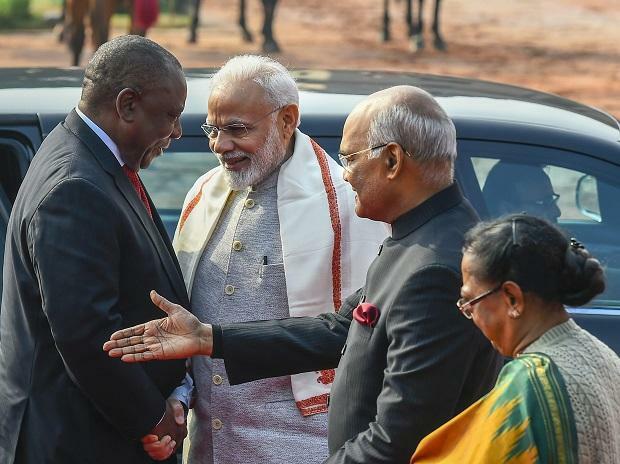 Talks are underway between Prime Minister Narendra Modi and South African President Cyril Ramaphosa to strengthen ties between the two nations and step up cooperation in a range of areas, including defence, security and trade. "New beginnings to old partnerships. PM @narendramodi warmly welcomes President of #SouthAfrica @CyrilRamaphosa ahead of delegation level talks. This is their fourth meeting within a year, highlighting enhanced engagement with South Africa & the African continent," Raveesh Kumar, Spokesperson, Ministry of External Affairs, tweeted. In another tweet, he said, "Fortifying strategic partnership. PM @narendramodi and South African President @CyrilRamaphosa held wide-ranging talks on cooperation in defence & security, trade & investment, skill development, S&T, education and technical cooperation and multilateral forums." Ramaphosa will be the chief guest for the Republic Day Parade on Saturday.